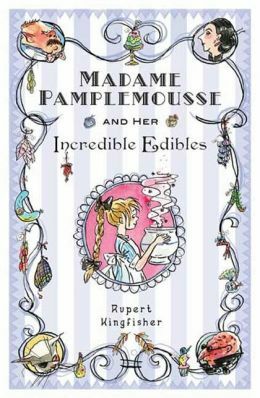 This month we enjoyed our yearly light summer kids book, and took a literary trip to Paris with Madame Pamplemousse and Her Incredible Edibles by Rupert Kingfisher. The group found it very refreshing, and was surprised how "not PC" it read, as though it were written decades before...really it could have been anywhere from the 30s to 70s! The illustrations were universally adored, for their great expressions and humor. Some folks were reminded of Lemony Snicket books, with terrible parents (how could they just shuttle her off for the summer like that? ), uncle (such a poser), and awful things in general happening to the child in the book. The food descriptions were probably by far the best part. What was really liked was the message, about being heartfully connected with what you do, and how it is transformative in nature. We enjoyed how the people who could cook were special/magical. This reminded us of the fantasy element of "the chosen one". We agreed that the book really captured how when you are in the flow cooking, you can be connected with the process and go beyond over-thinking. We discussed if Madame Pamplemousse is a witch, and concluded if so, she is clearly a good one. The library does own the sequel: Madame Pamplemousse and the Enchanted Sweet Shop. Katie S. - Croque Madame muffins from the Little Paris Kitchen and croissant s'mores. Discussion went all over the place after we talked about the book. Strong recommendation went out for Country Farms on 99, across from Ranch 99. Next month we will be discussion Yes, Chef by Marcus Samuelsson on Wednesday September 11, 2013.